Vladimir Kramnik, who became the world chess champion in 2000 when he defeated Garry Kasparov, said about that match, "At some point he (Kasparov) seemed to lose all confidence trying to break down the Berlin Wall." Kramnik won two games and drew the other 13, using the Berlin Defense of the Ruy Lopez to great effect. At the bridge table you sometimes have your back against a wall, needing a specific distribution to make your contract. You just have to make the best play and hope to get lucky. 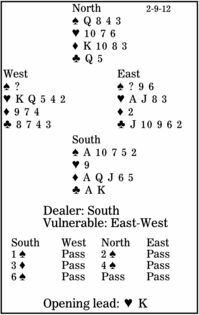 In this deal, South is in six spades. West leads the heart king and continues with a second heart. After ruffing, how should declarer proceed? Declarer has to play the trump suit without loss. This requires finding West with the singleton jack. So South should play a diamond to dummy and call for the spade queen. This works when West does have that singleton, and also when East has king-low and fails to cover the queen with his king. Note that cashing the ace can never work. Even if it drops the king, the other defender must collect a trick in the suit.